I have been teaching Curly to play the piano and she is really enjoys playing. She was excited to have the chance to have Skype lessons from a teacher with MacPhail Center for Music! They offer lessons for any ability level: beginner, intermediate, or advanced. I have been teaching Curly to play piano using the Faber Piano Adventure Series. I let MacPhail know where we were in the books and what Curly had learned so far through our lessons. They placed her with a teacher familiar with those books who worked with young piano students. Then we set up lessons once a week for Curly to work with her new teacher. The teacher picked up right where we left off in the books and helped Curly to finish her piano book. Time to order the next level!!! Curly had 1 lesson each week (with a few off weeks because we were out of town or the teacher was out of town). Each lesson was about 30 minutes and was conducted completely via Skype on our computer. A few minutes before each lesson the teacher would contact us via Skype chat and let us know that she was ready. Then we would call her with a video call and Curly would begin her lesson. We set up my laptop in our piano room so the teacher had a view of Curly and the piano keys so she could watch Curly play. The teacher began each lesson with some fun games that involved learning note names or singing the notes. They also played listening games where Curly had to listen and identify the note that the teacher played. They made up songs together and used hand motions to show which note they were singing. It was pretty darn cute to see Curly standing in front of the computer touching her toes while singing a note. Next, the teacher had Curly play her songs for her. They worked on dynamics, counting, learning note names, and rhythm. The teacher gave Curly many tips and helped her to polish each piece. Then she taught Curly new pieces in the books. She would clap, tap, or count out the new pieces with Curly and help her figure out the notes. Then they would mark certain aspects of the piece with colored pens and highlighters – marking for dynamics or when there was a rest. Once Curly felt comfortable she would begin playing that piece. Her teacher also taught her how to play songs by ear and encouraged her to learn to play Amazing Grace on her own. She also taught her to transpose pieces and introduced many aspects of music theory during the lessons. The little people in the house were very excited about Curly’s piano lessons and they often tried to sit int he room with her and watch. I had to stay busy keeping them out of the way while Curly was working with her teacher. So, I didn’t get to sit in on every minute of each lesson – I hid around the corner while keeping the other kids entertained. You definitely need a quiet space for the child to complete the lessons without too many distractions. That is hard in our house but we made it work! The teacher was wonderful – very patient and encouraging. She would gently correct Curly when she made a mistake (and when she kept making that very same mistake) and she gave her very specific encouragement and feedback. The games and introduction of theory! The teacher had such creative games and ways of teaching Curly the different notes. Curly had such fun working with her. I loved the way she introduced new songs and new concepts with the various games. It was more than just learning the songs in the book. The teacher introduced playing by ear, recognizing notes by sound, learning about skips and steps, and transposing pieces. Curly learned so much more than just what was included in her lesson book. The teacher provided detailed practice charts for Curly so she could practice on her own throughout the week. Then she emailed me a more detailed outline of the practice with instructions for me so I would know how best to help Curly. These were so helpful in our practice times. I felt I could easily assist Curly with practicing. We got to have piano lessons right in our own home! I didn’t have to find a teacher, load up 5 children, travel across town, and then entertain 4 children while 1 child has a lesson. This is the ultimate convenience! We really enjoyed having our lessons come to us! I was so very impressed with our teacher from MacPhail. I wasn’t sure how a music lesson would work via Skype but I was pleasantly surprised. The teacher was able to see and hear Curly play so she could provide immediate feedback. She also included multiple different aspects of playing into each lesson and covered topics far outside the scope of our lesson books. The lessons were very thorough, fun, and Curly made significant progress just in our 4 lessons that we had. We loved our experience and would gladly continue if it fit into our budget. 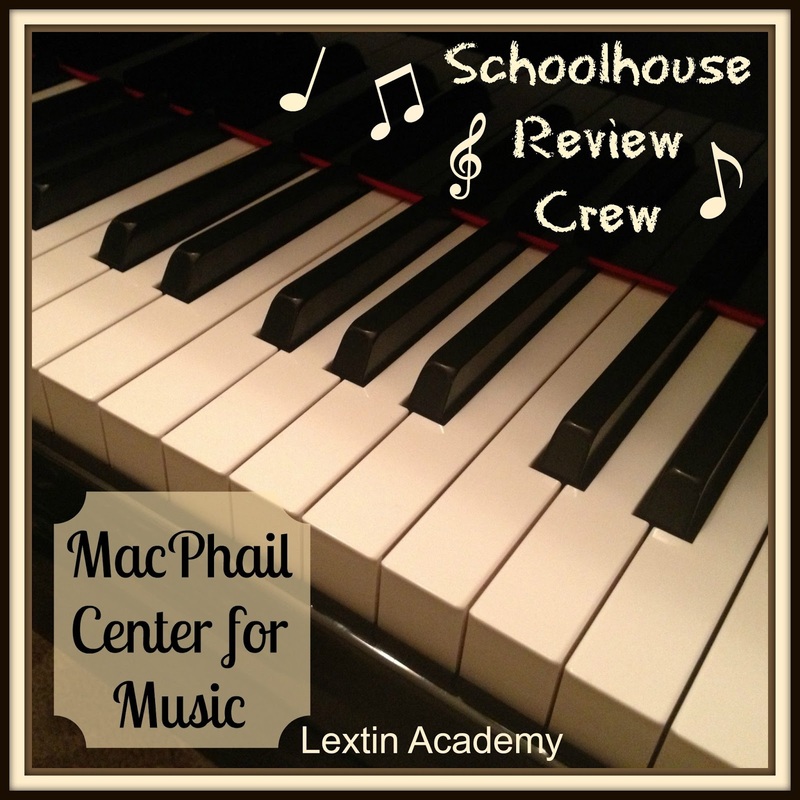 As Curly progresses in her piano studies we plan to budget for a teacher and we would highly consider lessons through MacPhail. These online lessons are perfect if you live in an area that does not have teachers for a specific instrument or if you would rather have lessons from home without any travel time. Here is a video of part of Curly’s lesson and here’s a second video clip if you want to hear more of Curly’s little concert from another angle. Also, please enjoy all the little sounds from Punkin who was drooling all down my arm……..
Read other Crew reviews of MacPhail here!